How should I configure Mail.App and Google Mail? I'm running the Mac OS X 10.6 version of Mail.app and accessing Google Apps' mail via IMAP. I'm trying to make the integration as seamless as possible because I'm thinking of switching my wife to the combination. I've used the Labs Advanced IMAP Controls to remove hide Starred, Chats, Spam, Bin, and — perhaps importantly — All Mail from my IMAP client. What I expect: when I delete a message from the Inbox, it's archived. What I get: the message disappears from Mail.app, yet remains visible from Google Mail. How can I tweak this so everything works as advertized? Gmail is very special when it comes to IMAP. Gmail uses labels, not folders, and there is simply no one-to-one mapping to IMAP. For example: putting a message in the Trash actually kind of assigns the label "Deleted". When labeled as such, any other label for that same message no longer applies. Be sure to understand the implications of this. Like if you think you copied a message to some IMAP folder, then actually Gmail will only have assigned an additional label to the very same message. Now, if you've (wrongly) set up Mail to move deleted messages to the Trash, then after "deletion" of either of the two occurrences of that single message, the other is removed as well. How do actions sync in IMAP? The Gmail SMTP server automatically moves a copy to your Sent Items. So, when using that server, be sure to set up Mail.app to Use only this server. If you don't, then when Mail falls back to another server, you won't have a copy in your Sent Items. If you want to use another Sender address, then see Adding a custom 'From' address; if you don't then Gmail will change it into your gmail.com address. For fine tuning see the recent new feature Send mail from another address without "on behalf of". Changing the Gmail language also changes the names of things like Trash (Bin) and Sent Items. So choose the language before telling Mail about the usage of the mailboxes (using menu Mailbox, Use This Mailbox For). Be sure to create a backup. If messages are somehow deleted form either your computer or Gmail's servers, then after the first IMAP synchronisation they're removed everywhere. 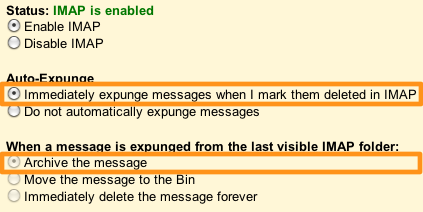 (Or, for non-IMAP accounts: deleting any account also removes all of its messages!) When using Time Machine, then to restore items: first activate Mail and then enter Time Machine. This will give you the galaxy and star field with, instead of the default Finder, the Mail interface. Here you can even restore message from accounts you've deleted altogether. Select "Do not automatically expunge messages"
Select "Immediately expunge messages when I mark them deleted in IMAP"
If you don't automatically expunge, you can manually expunge by right-clicking the folder in Mail.app and selecting "Erase Deleted Items…" from the menu. If you removed the "All Mail" option via the Gmail Labs function - your GMail is then set to display ALL MAIL irregardless of whether it is Archived or not. That might explain why you are seeing it in GMail Inbox still - try not using the Gmail Labs function, and it should work now. EDIT : If the instructions is muy unclear to you, just do this - get your ALL MAIL function back. Not the answer you're looking for? Browse other questions tagged gmail imap apple-mail label or ask your own question.